Supported Java SE 8 versions are Oracle JDK 8 , OpenJDK 8 . Newer Java SE versions may work, but are not officially supported by the deegree development team. If you are confused by the two options and unsure which version to pick, use the ZIP. Both variants contain exactly the same deegree software, they only differ in packaging. If you don’t see this terminal window, make sure that the java command is on the system path. You can verify this by entering java -version at the command prompt. Also ensure that JAVA_HOME system environment variable points to the correct installation directory of a compatible JDK. To shut deegree webservices down, switch back to the terminal window and press CTRL+C or simply close it. If you want to run deegree webservices on system startup automatically, consider installing Apache Tomcat 8 as a system service. 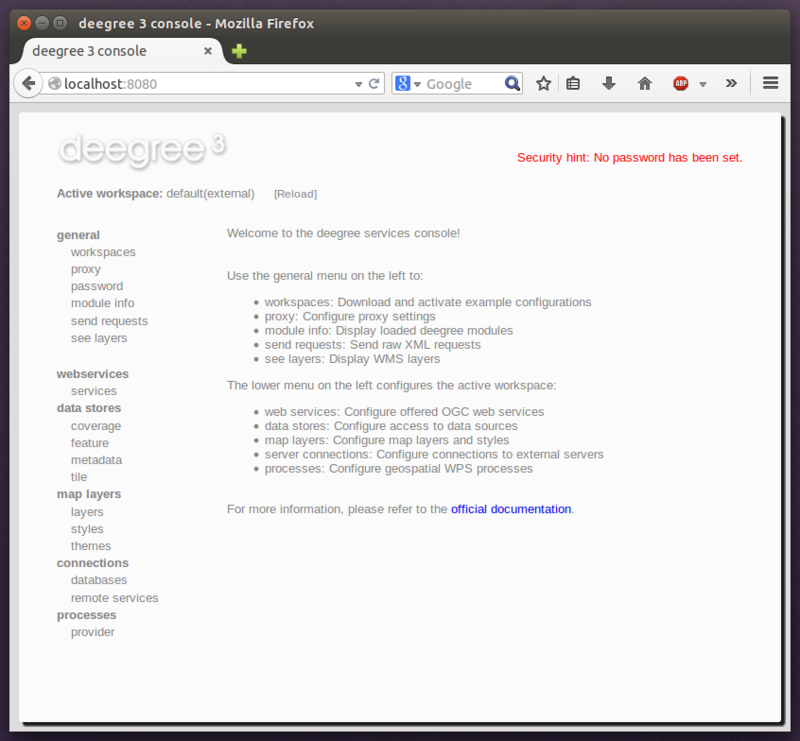 Afterwards, download the WAR version of deegree webservices and deploy it into your Tomcat installation (e.g. by copying the WAR file into the webapps folder). Consult the Tomcat documentation for more information and options. Oracle JDK 7 and earlier versions are not supported anymore, be aware that those versions are out of maintenance and reached End-of-life. OpenJDK binaries are provided by Azul Systems or AdoptOpenJDK. Requires an installation of Docker Community or Enterprise Edition, download Docker from www.docker.com. A Java Servlet 2.5 compliant container is required. We recommend using the latest Apache Tomcat 8 release. As of deegree 3.4.0 the ZIP distribution bundle is deprecated and the download links are removed from the website. Download the ZIP from the Nexus repository instead. © Copyright 2013, The deegree project. Created using Sphinx 1.2.3.